Members from the fraternity paid their last respect to the Sadma actress who was known for her strong screen-presence and amazing comedy timing. It’s still hard to believe that Bollywood’s Chandni is no more. Sridevi who ruled millions of hearts left for heavenly abode on Saturday, creating a void in B-town. The Nagina actress was cremated with full state honours in Mumbai’s Vile Parle on Sunday. Her untimely demise at the age of 54 sent shock waves to the industry and fans. Thousands of fans flocked to Celebrations Sports Club on Sunday where her mortal remains were kept for prayer and meet. Sridevi who was considered Bollywood’s first ever female superstar created ripples at the box office. Members from the fraternity paid their last respect to the Sadma actress who was known for her strong screen-presence and amazing comedy timing. They have mourned the death of the talented actress who charmed everyone with her performance. 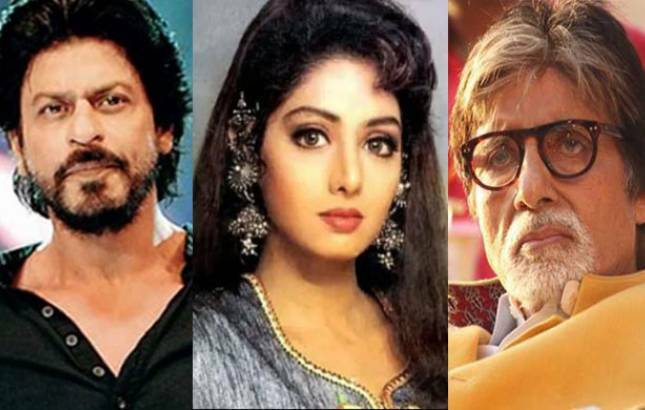 Veteran actor Amitabh Bachchan who has worked with Sridevi in Inquilaab, Khuda Gawah and Aakhree Raasta took to Twitter to share a poem for the beloved actress. Big B had a cameo role in Sridevi’s comeback film English Vinglish which was released in 2012. तुम जैसे गये ऐसे भी जाता नहीं कोई"~ कैफ़ि आज़मी. देहर - means .. the world . Javed Akhtar narrated this sher to me at funeral of Sridevi .. said it was written at time of Guru Dutt demise ; but so appropriate for today ..
Just before Sridevi’s untimely demise, the ‘Deewar’ actor had expressed his restlessness on Twitter. Shah Rukh paid homage to his Army co-star in an emotional message on Twitter. The message left us teary-eyed and showcased the love and respect Sridevi has earned over the years from the industry. The Himmatwala actress’ last outing on the silver screen will be SRK starrer Zero. How can one not just feel love & beauty & be grateful for a life that became a part of yours in some small way by making it prettier....isn’t it just easier to feel love & give towards that life, even in death...the comfort of appreciation and gratitude. Bollywood's Dream Girl Hema Malini also paid tribute to the Judaai actress and her dear friend on Twitter. Sridevi was one of the most adored and respected actresses we have in Bollywood and an inspiration to many. Her craft spanned across many languages including Telugu, Kannada and Tamil. Saying anything about the actress who gave her heart and soul to the industry will be an understatement. Though Sridevi is no more with us but she will definitely stay alive in our hearts forever.